The more I travel, the more I find myself staying in long-term apartments or vacation rentals over hotels. Like this beautiful place I used last week in Playa del Carmen. When planning a vacation, the obvious choice for most people is staying at a hotel. They’re pretty easy to find and located in the heart of your travel destination. Everyone knows about hotels. However hotels are usually not the best deal out there. Choosing to stay in a vacation rental apartment is a great alternative to hotels, and can even save you money. They offer more space, better amenities, and give you a feeling of home. Check Out this Huge Kitchen! Last weekend I had the privilege of staying at one of Bric’s vacation rentals near the beach in the heart of Playa del Carmen, and had a wonderful time. It was a huge 3 bedroom penthouse apartment with multiple balconies, floor to ceiling windows, and a rooftop pool. 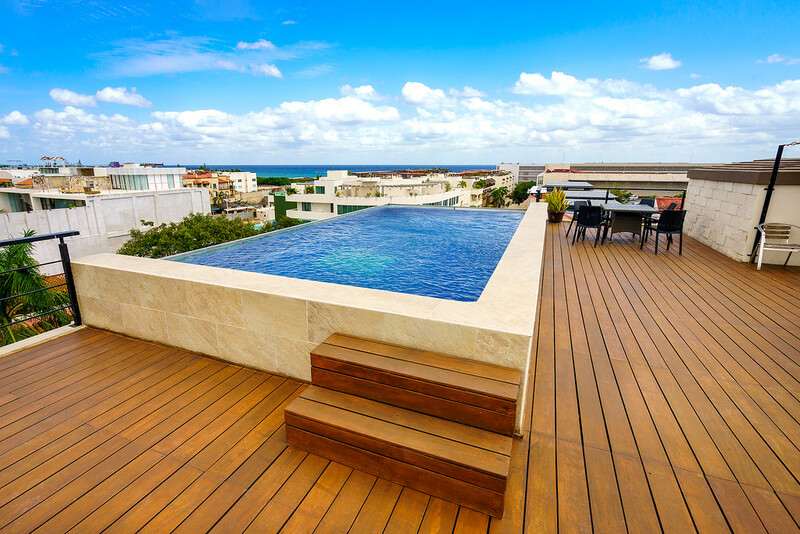 The building was only a short walk from Playa del Carmen’s sun-drenched beach — and right next to 5th Avenue, the main walking street and entertainment district full of shops, bars, and restaurants. Now I admit these accommodations are a bit bigger and more luxurious than I’m used to, but I was also surprised to learn it’s pretty affordable if you were to stay here with a group. 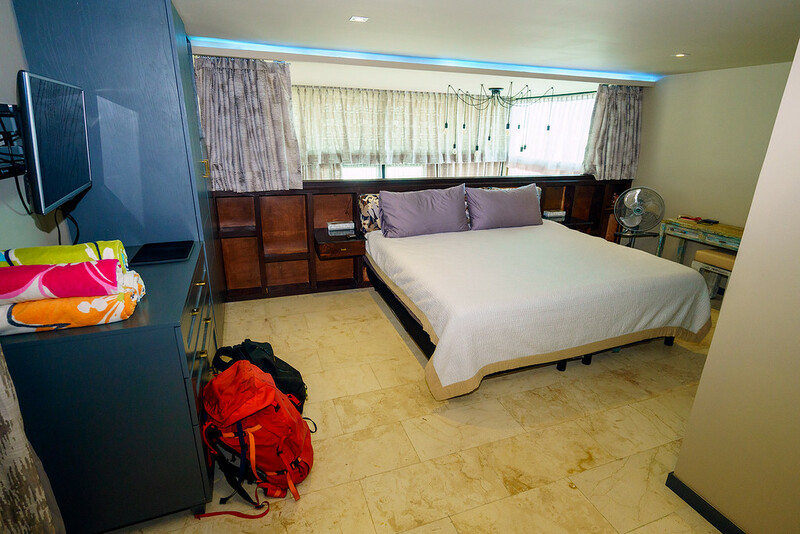 With plenty of room for 6 people, and a price between $285 – $385 USD per night depending on the season. That’s only $48 – $64 per person, per night. For a giant luxury penthouse! Not. Too. Shabby. 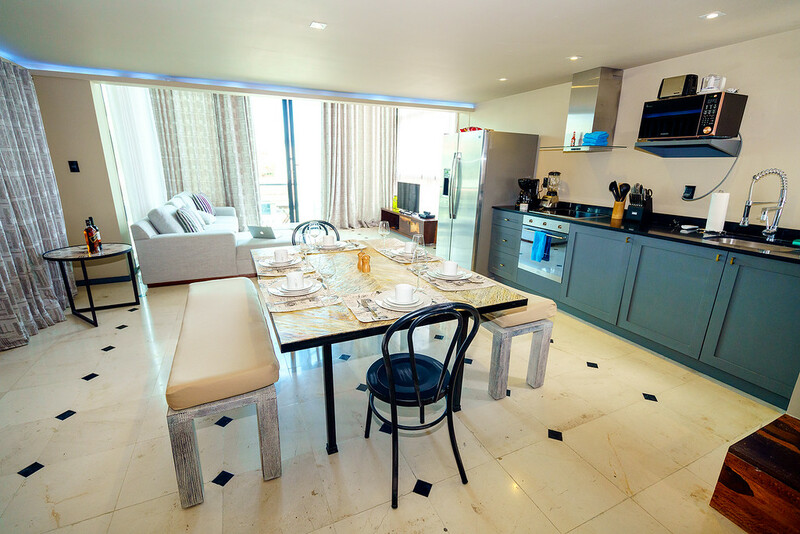 However Bric Rentals doesn’t only deal in luxury properties, they have vacation apartments for all kinds of budgets — like this 2 bedroom home with room for 6 for only $85 USD per night. Here are some reasons why I prefer vacation apartments over hotels. Save Money! Especially true when traveling as a group. More Space! Spread out in a large apartment or condo. Full Kitchen! Make your own healthy meals. Meet Locals! Many rentals are located in neighborhoods. Free Internet! I can’t stand when hotels charge extra. Laundry Machines! This alone makes it worthwhile. Bring Your Pets! Usually not an option at hotels. Feels Like Home! Relax & make yourself comfortable. 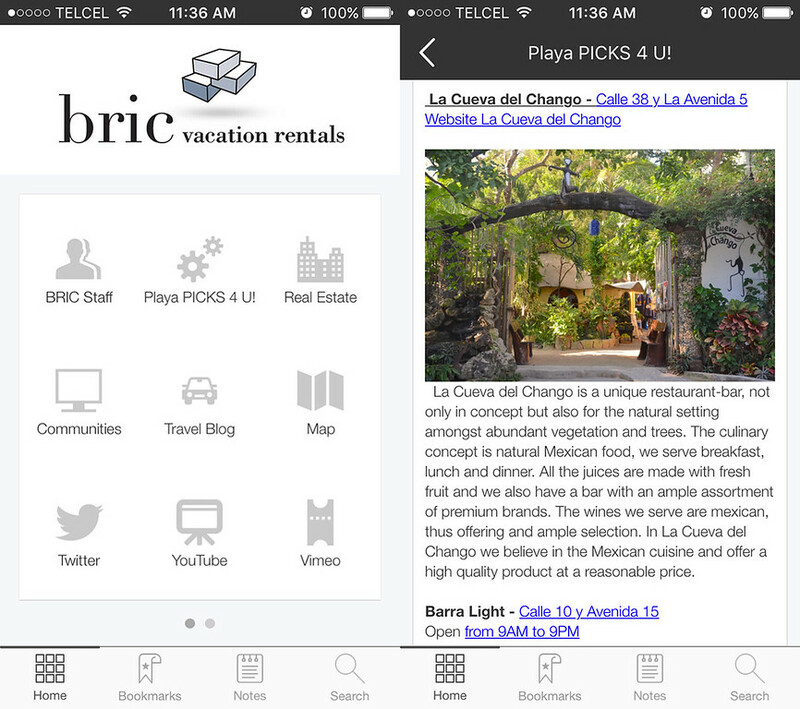 When you book a vacation rental with Bric Rentals, they also provide a free smartphone app to give you advice about fun things to do in Playa del Carmen, restaurant recommendations, tips for getting around, and more! Honest tips coming directly from their friendly team of long-time Playa locals. Smaller and less touristy than Cancun, Playa del Carmen is becoming a popular travel destination for people looking for travel experiences that are more substantial than your typical all-inclusive resort. It’s a fun beach town on Mexico’s Yucatan Peninsula along the Riviera Maya, about 40 minutes south of Cancun International Airport. Flights from the US & Canada are relatively cheap too. You can often find round-trip tickets from major cities for under $300! La Quinta Avenida (5th Ave.) is a pedestrian walkway that runs for about 3 miles through Playa del Carmen about 1 block west of the beach. It’s lined with shops, bars, restaurants, cafe’s, gelato shops, and art galleries. Mamita’s Beach Club is a lounge and beach club in the heart of Playa that’s known as the place to be “seen” sunbathing by the ocean. They have beach chairs or daybeds for rent with music and waiters serving cocktails. 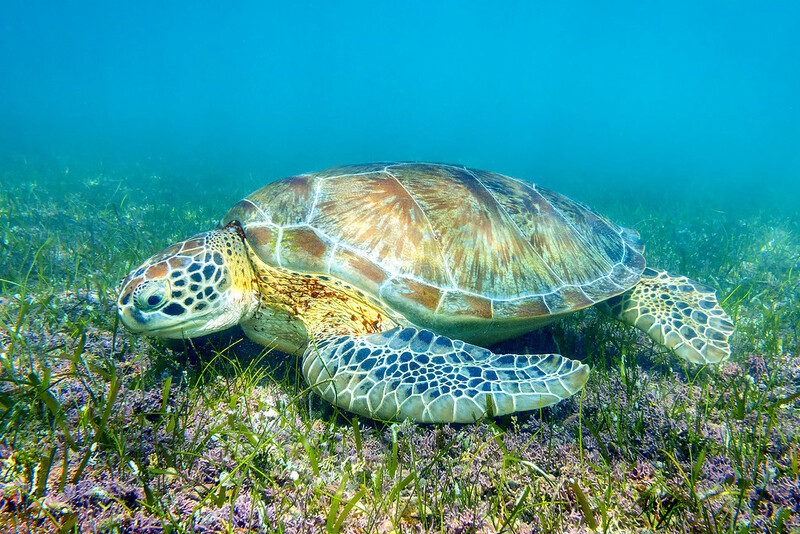 Akumal Beach is located about 30 minutes south of Playa del Carmen, and famous for its resident sea turtles who munch on the grass under the waves. Visitors can rent snorkel gear and swim with these large graceful creatures. Many ancient Mayan ruins surround Playa del Carmen. Spend the day exploring sites like Chichen Itza, Tulum, or Coba and live out your Indiana Jones fantasy. My favorite is Coba, as you can still climb the pyramid! Located 40 minutes away from Playa del Carmen by boat, the island of Cozumel has some of the best snorkeling & scuba diving in the Caribbean. Or rent a dune buggy and drive around the island stopping at different scenic beaches for the afternoon. Cenotes are limestone sinkholes filled with fresh water that are part of a massive underground river system in the Yucatan. These swimming holes are a wonderful place to cool off from the heat of the sun, or if you’re a scuba diver, explore the deep underwater tunnels. 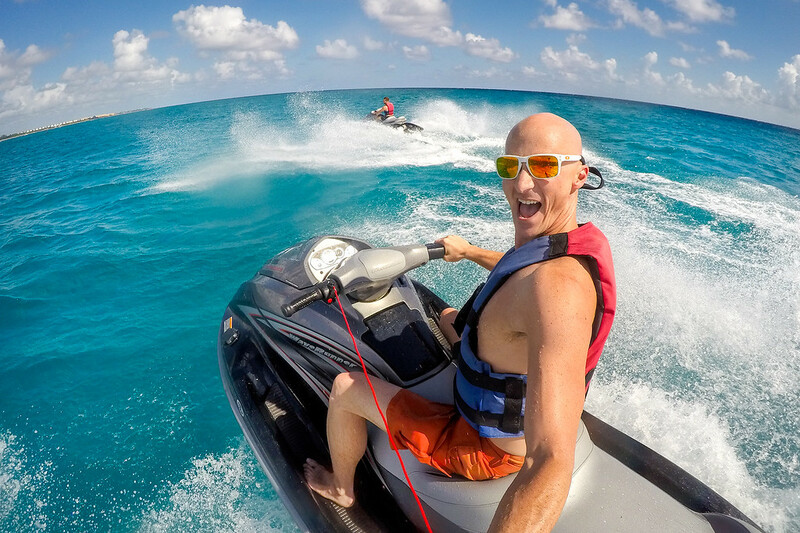 What would you do on vacation in Playa del Carmen? My wife and I were just looking into family plans for a Playa De Carmen summer trip this morning. Looked into snorkeling, visit Chichen Itza, a ferry trip to Cozumel, rest & relaxation with kids on beaches and write my own review of our visit. It has been 21 years since our last visit to Play De Carmen (Honeymoon destination). Looking forward to going back soon. I will go shopping on 5th Avenue and go swimming with my family! Yeah! Micheladas are the best. I would love to explore Mayans ruins, walk 5th avenue, and go swimming in Playa del Carmen. Can’t beat the beautiful Mexican beaches. Thanks for sharing. I’m ready to go! I would explore 5th Ave. and do lots of swimming! It would also be neat to explore ancient ruins! Sweet! We’ll have to go on another adventure together Dani. I live in San Diego but I’ve never been to Mexico! I hope to go sometime in the future though!! We love PDC just was there in January and stayed in the older neighborhood near Esmeralda beach-would love a fancy free nights with my hubby who is conquering cancer and Playa made him feel so good-we are exploring the area again come winter and this would be a great starting point! Choose us!!! I would explore the beaches and cenotes, wander the town, and take pictures of everything! I loved my time in Playa del Carmen. My favorite ruins were the Ek Balam ruins, near Valladolid. Well…I’m hoping to get some sun, swim with turtles, sip on a margarita and a pina colada and forget about doing anything!! I never used to be a total beach bum…that is until I traveled to Thailand and the Philippines. Im thinking there is nothing better than sitting on a beach and soaking in the sun!!! I would absolutely bring my newest friend who has never been outside of Massachusetts. They have never met someone who like to travel as much as I do and what a beautiful place to start!! Visit everything and take lots of pictures enjoy every moment! Hey matt! Glad to hear you had fun there! Quick question for you, what software do you use for your photo and video editing? They always look flawless! Hope to see what Playa del Carmen is like! I spent the month of Feb there in 2015 & boy had PDC changed since I was there in 2000. So much more built up, but the clear waters still dazzle. I would spend 75% of my time in that roof top pool… Gorgeous!! Can already see myself there ? I would LOVE to just explore the local scene – take a day doing that, hopefully visit some ruins, and then take some time to relax! This would be a great adventure. I’ve never been to Mexico, but Playa Del Carmen is high on my list! Pretty sick place! Would be a great place to go on vacation with 6 of my friends, and cheap too. Sun, swim, explore, eat, drink, repeat for 3 days! Great blog. I’ve been using VRBO and Airbnb for years now (mostly VRBO and more recently Airbnb) for travel in US and Caribbean and it can be a bargain compared to hotels. We haven’t had many issues but definitely some places are better than others. Thanks for your insightful blog and keep traveling the world Matt! This is so awesome, I just entered the contest. I’d go on plenty of adventures like you did! Hi, this site is amazing, thanks to sharing, great giveaway! I would relax on our honeymoon after an October wedding! I am in playa del Carmen right now! I booked my flight and an affordable airbnb listing right after reading your first post about pdc! If you’re still here I’d love to meet up with you! Awesome Marco! Love to hear that. Yeah I’m still around. Shoot me an email. Looks like a great giveaway. I’m in Mexico right now and love it so much. your pictures pictures are beautiful! So I totally have a few questions! One is what are suggestions and tips you would give to someone who has never traveled outside the U.S.?!? Where would you suggest?!? Two is how have you done all this traveling all these years, like how do you maintain yourself and afford it?!? Three, do you ever feel unsafe or suggestions for a younger lady?!? Four, How do you manage your traveling time and fun and your blogs and uploads and photography?!? Five, what do you use for your camera editing?!? Six, what is the craziest, most adventurous story you have to date?!? Seven, what are the hardest parts to traveling and being in foreign countries?!? Thank you for your time! Haha. That’s a lot of questions Victoria! Here are some posts I’ve written that should help. As for my craziest story, I actually haven’t written about it yet. I will soon though! In the meantime, these are some of my favorite experiences. I went to playa del carmen in an all inclusive resort but i’d love to be back to really explore and enjoy the life out there! Ill be in playa del carmen and cancun in may! thanx! We have used Air B&B and VRBO before. Had never heard of BRIC Rentals. Thanks for the heads up and the chance to win! Airbnb and VRBO are websites where people can advertise rentals and companies like BRIC Rentals actually operate the rentals. They will handle everything you need and more, similar to what a resort would do. I want to get my scuba diving license and hit up the reefs with my kids! I love Playa – I wish I could be there for longer than just a week! How much would it cost roughly for a two week stay in Playa del Carmen including food, accommodation, transport and activities? If I went to Playa del Carmen I would definitely check out the diving and snorkeling! I love the beach more than anything so I would spend all my time there! I would definitely want to visit the Mayan ruins, I love exploring and hiking. And swimming with sea turtles looks like so much fun! Thanks for the giveaway Matt! If I win I would go to Playa del Carmen to prove my family and friends wrong that Mexico is not in fact a scary and dangerous country to avoid but that it is just like any other place where you have to be smart and aware. Everything looks great! Thanks for the giveaway! I would take my family for our first vacations together! The view must be awesome from the swimming pool!!! Fingers crossed! Mexico is on my list and my friends and I would love to visit! I would love to go there and swim with sea turtles! Going on a Mini Mexican Adventure next month with my best friend / housemate. Planning to hit up a tequila factory and wear a Sombrero. BUT MORE IMPORTANTLY discover the beautiful sights and sounds of Mexico. Can’t wait to dip my toes into Ik Kil and explore the memorizing wonders of Chichen Itza ruins. P.S Your Instagram account has become my travel bible. Ik Kil is ok, but photos make it look nicer than it really is. It’s usually overflowing with people. I think you’ll enjoy other cenotes more… like Garden of Eden or Choo-Ha. Have fun on your trip! Amazing – thank you for the heads up on these places. We will definitely go and check them out. If you have any other recommendations please let me know!! You’re right as it’s rare to enjoy accommodations that nice. This would a luxurious break from backpacking. And I could use some sweet rooftop pool pics? Enjoy! The beaches of Mexico call my name and I always trust your recommendations, it sounds awesome! Great turtle shot you got. What camera did you capture? Is there any equipment additional? I would spend three romantic days with my beautiful girlfriend, swimming and going walking on the beach. Playa del Carmen is absolutely beautiful! Snorkeling with the turtles was such an awesome experience. I’d love to make it to the ruins this time around, fingers crossed! I love Playa. I am here for the second time in 2016 already and have been coming here for many years. I am working on my spanish and would study again if I were to be the lucky winner. What to do? So many things! Swim with turtles (just like Matt did), visit Chichen Itza and stay for the fabulous night show, take a day trip to Cozumel. The list goes on. I’ve never tried snorkeling but would LOVE to give it a go. I would soak up the sun, hit the jet skis, do some shopping and of course some drinking! I’d love to win – PDC is an awesome place. I’d like to stay in a vacation rental instead of a hotel! I’m always so busy, I would love to just relax and enjoy the vacation! Dine, drink and savor the time away from my day to day life! Day trip to Cozumel. I’m way too restless! Great tip even if I don’t win! Renting a place if we go as a family is well worth it and in the end a savings! If I won the trip I would take my 8 month old daughter to meet her father who hasnt seen her since she was 2 months old! Would make a great family reunion! Sea turtles swim seems like a great day out! As I continue to always update my bucket list, I recently realized the many cool things to do in the Yucatan! My Goal is to visit the temples like Chichen Itza and definitely swim in the cenotes, especially Ik Kil. If I can time it right, perhaps I can even go down there during Dia De Muertos but to be honest, the Yucatan in itself is its own adventure! Sounds like a good itinerary Eric! I hear there is great scuba diving there. I would love to go diving. We’ll be there later this year! Crossing my fingers, we love Airbnb and BRIC for our longer stays too. Crossing my fingers! I’d go snorkeling everyday. I also love to walk the beach and collect seashells. So gorgeous! I’d go snorkeling every day! I’d also walk the beach and look for seashells. So gorgeous! Swimming with turtles would be amazing. I want to relax and enjoy the sunshine. This would be so much fun! Just visited Playa del Carmen last week. Can’t wait to go back to the beautiful beaches there. Never been to Playa Del Carmen, but this would be a great excuse for me to go! I’ve always heard great things about that town and it is on my list of travels. I love Mexico but I’m typically on the opposite side of the country when I’m there :) Thanks for the chance! My parents just stayed in a vacation rental in Akumal and they said it completely changed their outlook on travel. They’ve always been the type to bring snacks or food with them, and I remember a few times in USVI cooking on a hotplate in our camp site. So for them to find a deal by using vacation rentals instead of hotels AND be able to actually cook, they were hooked. I’d love to win to be able to visit Playa Del Carmen and maybe bring the folks with me! Haha. Of course you do! Good luck Anna.